• Cu Shielding Technology™ provides for maximum isolation from environmental EMI and RFI via use of three layers of shielding: two 80%+ OFC copper braids and one 100% overlapped Mylar® foil. Sonicwave Analog audio “Y” cables perform at the very highest level. Silver-plated OFC twisted-pair conductors are purposely designed to deliver delicate audio signals with perfect fidelity! Impact Acoustics’ Cu Shielding Technology™ provides three layers of shielding: two 80%+ OFC copper braids and one 100% overlapped Mylar® foil. This state-ofhe-art design eliminates environmental interference, and ensures astounding micro-dynamic performance coupled with amazingly quiet backgrounds. SplitLok™ connectors feature the use of precision-machined surfaces and a split center-pin for a solid, dependable electrical contact. Precise soldering techniques using expensive silver solder and the Flexcable™ ultra-flexible PVC jacket guarantee performance under the most demanding conditions. Value Series Audio Y Cables are the perfect solution for adapting your audio connections to meet your application needs. These cost effective cables are of higher quality than most standard audio cables giving you crisp, clear sound for less. The dual conductor is 90% spiral-wrapped, which provides shielding against EMI and RFI interference. The connectors are fully molded to provide excellent strain relief. 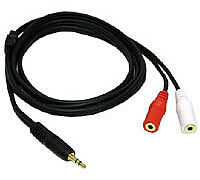 Audio Y Adapter Cables allow you to split a signal or adapt from one connection to another.